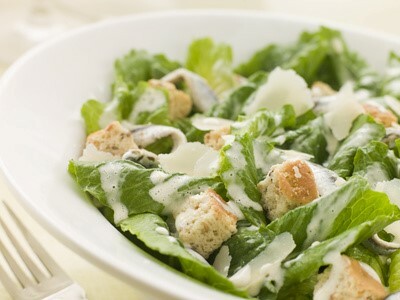 Good Cesar salad is good timing, so it's not a bad idea to prepare all the ingredients in advance. All the ingredients for the dressing should have room temperature, so take them out of the fridge. Wash the lettuce in cold water, dry it and separate the leaves. Tear them by hand (don't use a knife!) into uneven bits. Wash the chicken breasts and cut them in half horizontally. You will then have thin fillets. Season them with freshly ground salt and pepper. Cut the baguette into rough cubes for the croutons. Chop the garlic (or use a garlic press). Prepare a big frying pan with a lid and heat the oven to 200C. The secret to a Caesar salad is its dressing. The right texture and taste are crucial. Grate the parmesan cheese yourself (don't use ready-grated) and put all the dressing ingredients into a mini blender and blend until smooth. You can adjust the taste with more lemon juice, mustard or mayo. Spread the baguette cubes in a single layer on a baking sheet and put them into the hot oven for 3-5 minutes. In the meantime, heat the pan, then fry the croutons on 2 tbsp oil together with one chopped garlic clove until golden. Take the croutons out and put them aside (cover them to keep them warm). Use the hot pan, add the other chopped garlic clove and the rest of oil, fry the chicken breasts from both sides until golden. Put the lid on and leave the pan on the cooker for one minute. Remove the pan with the lid still on, turn the fillets and let them sit in the pan (with the lid on) for about 2 more minutes. Put the lettuce into a large bowl, pour over most of the dressing and mix slightly. When serving, put a good portion of the leaves on the plates, lay the chicken fillets on the leaves and add the croutons. Shave the parmesan cheese on top and sprinkle with the rest of the dressing.